The absence of any signal of financial aid from Bahrain’s neighbors sent the kingdom’s credit risk rising the most in emerging markets this month. 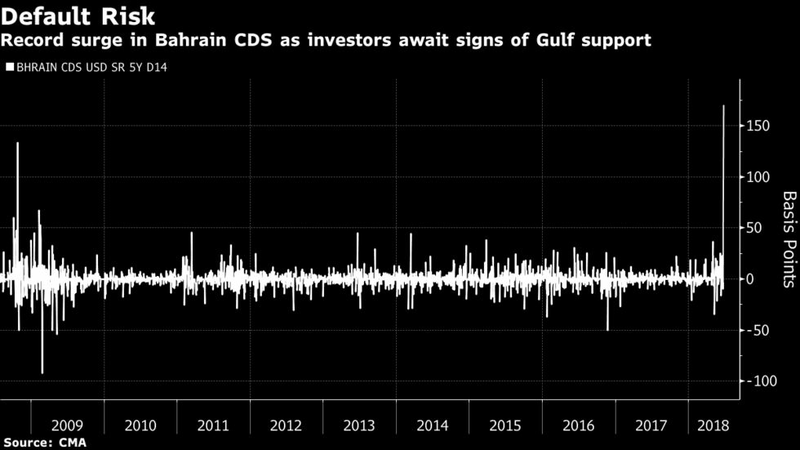 The cost of insuring Bahrain’s debt against default for five years jumped 170 basis points on Monday, the most since records began in 2008, to 609. That’s the highest among emerging-market peers after Lebanon. 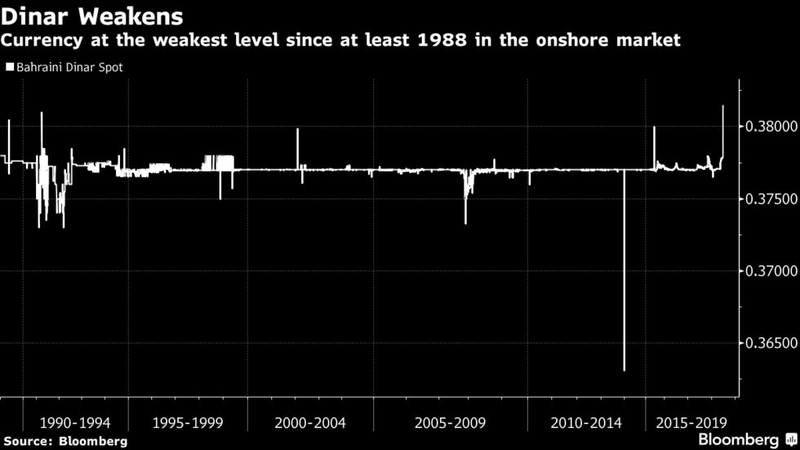 The dinar, whose peg to the dollar has been effectively unchanged since 1980, fell a fourth day in the onshore market to the weakest level since at least 1988. The central bank said Tuesday it’s committed to keeping the dinar’s peg, spurring a decline in the yield on Bahrain’s dollar bonds due 2022. But the authority’s assurances won’t ally investors’ fears, said Nick Stadtmiller, the lead Gulf analyst at Medley Global Advisors. “That’s because the question isn’t whether the central bank is committed or not, the question is whether they have the FX reserves to keep it going,” said Stadtmiller. The central bank’s foreign exchange assets plummeted to a 2001 low of about $1.2 billion last year. They have almost doubled since, helped by cash raised through bond sales, but the government has about $2 billion of interest payments on bonds through 2019, according to data compiled by Bloomberg. The International Monetary Fund expects the island kingdom’s debt to exceed 100 percent of economic output in 2019. Investors are seeking reassurance from Bahrain’s Gulf allies that they will offer assistance to the cash-strapped nation. Its debt has also been battered as escalating trade tensions between the U.S. and China damped demand for riskier assets. Bahraini officials have repeatedly said they don’t plan on abandoning the peg to the dollar. But if the country were forced to shift its currency policy, it would raise doubts that other members of the Gulf Cooperation Council can sustain their pegs. The nation, which has been slow to implement reforms after oil prices fell, was said to have asked Saudi Arabia, the United Arab Emirates and Kuwait for financial assistancelast year as it sought to replenish foreign reserves and avert a devaluation. It’s the only Gulf oil producer that needs prices to climb beyond $100 a barrel in order to balance its budget this year, according to IMF estimates. Brent crude was about $75 a barrel on Tuesday.